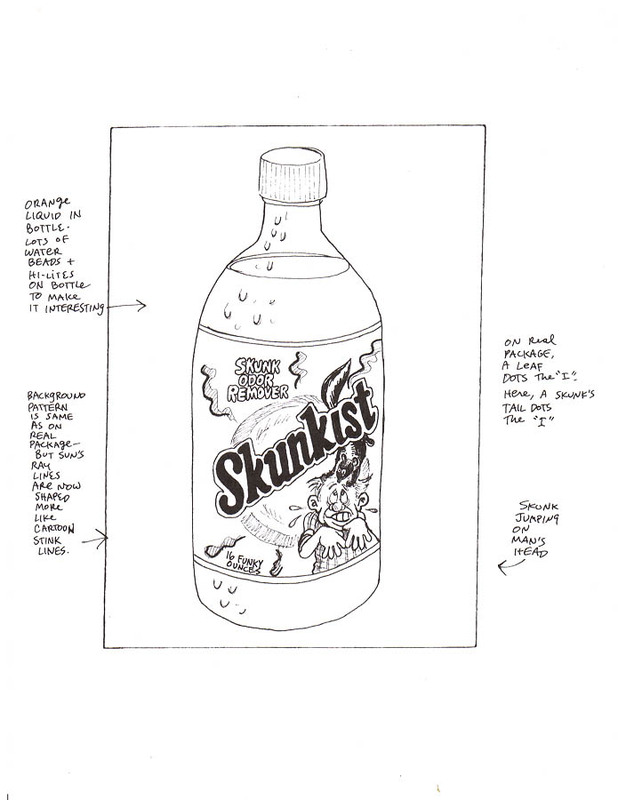 In Jay Lynch's rough, the Skunkist product is a "skunk odor remover" and the bottle contains "16 FUNKY ounces." In the real Sunkist logo, the letters "u" and "n" run together; Lynch separated them in his "Skunkist" sketch, while in the final art (below), Sean Greathead painted them as joined. On the final art, Skunkist was changed to "16 FURRY ounces" of "skunk enticement beverage." The Topps Vault sold the finished art for "Skunkist" for $1025.11 in an eBay auction which ran from August 28 to September 4, 2005. The Middle Middle (MM) piece of the "Buzzooka" puzzle is found on the back of "Skunkist."